All transactions are safe and secure with a reliable history in online purchasing behind each of our associates. 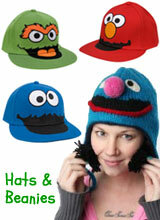 Buy the Sesame Street Character Hats and Beanies to own Sesame Street clothing and merchandise. There's no better way to shield your face from overly sunny days than with one of these character Sesame Street hats. A fan favorite among adults and teens, these caps are the perfect way to show everyone your favorite member of the street. From Bert and Ernie hats to warm Oscar and Grover knit beanies, you'll be ready for all seasons. The Sesame Street beanies are also a great way to show off a little character on the ski slopes. In addition to the Sesame Street Character Hats and Beanies above, browse the Sesame Street Clothing Gallery for more apparel like men's and women's clothes, kids shirts or hoodies.